The Birmingham Museum and Art Gallery made some history of its own on 29th January 2014 as a cake, celebrating the launch of a Heritage Lottery Funded exhibition mapping the identities of Birmingham and West Midland transgender individuals, was cut by the Lord Mayor in the Community Gallery. The exhibition entitled Mapping My Journey organised by Wolverhampton based charity Gender Matters remains in the community Gallery until Sunday 16th March 2014. Positioned in the heart of Birmingham the exhibition rang true to the spirit of LGBT History Month, the annually observed celebration of LGBT identities which has been marked every February since the 2005 abolition of Section 28. Despite Section 28 only explicitly attacking homosexuality the exhibition perhaps stands as an indicator of the progress that is being made in the public discussion of LGBT identities since the legislation’s introduction in 1988. Even if this is so the exhibition’s very existence is an acknowledgement of a transgender community who, not only in the West Midlands, have been left lagging behind in the political victories of its lesbian, gay and bisexual counterparts. Despite that discrepancy in progress the room was, by the final speech of that evening, full of proud and hopeful smiles. The exhibition’s success stemmed from not only from the celebratory representations of transgender identities, refreshing against a backdrop of all too often negative or sensationalist representations in mainstream media, but also the multiple mediums the exhibition works with. Photographs explored gender expression, art work reminded us of gender dysphoria; video, audio interview and exhibit displays from binders to hormone replacement gave the everyday reality of what it means to transition or identify outside of the gender binary and it was that representation of multiple transgender identities which was most impressive. Mapping My Journey is an exhibition entirely accessible to individuals who identify as LGBT, who are allies, or even individuals with little or no knowledge on the processes of transitioning or the vast array of identities under the transgender spectrum. I left the gallery that evening most happy with how many positive images and triumphs (despite the stories of struggle) I had seen and felt armed with an increased knowledge of those individuals’ lives. It was therefore not only in the exhibition’s symbolic significance of inhabiting that space but also the fine educational content that ensures that Gender Matters’ work in that community space will far outlast the stay of the exhibition. Want to advertise your group? Get in touch. 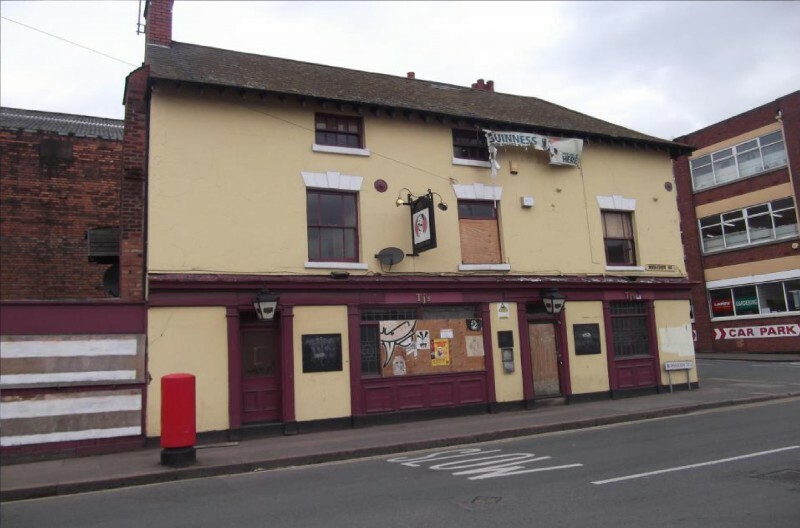 Conference – Sunday 23rd March, 3pm, The Old Printworks – Balsall Heath. BEAST stands for Birmingham ElectroAcoustic Sound Theatre: the concert arm of the research team of the University of Birmingham’s Electroacoustic Music Studios. For three decades it has been part of Birmingham’s avant-garde soundscape, and if you have taken the opportunity to listen to them before, you are not likely to be much surprised the next time. If you have never been to any geeky sound performance, then a free walk-in walk-out event like this Friday’s is a good opportunity to listen intently to un/familiar sounds, emanating from an ivory tower rather than from an underground club. The format was unusual and easygoing. 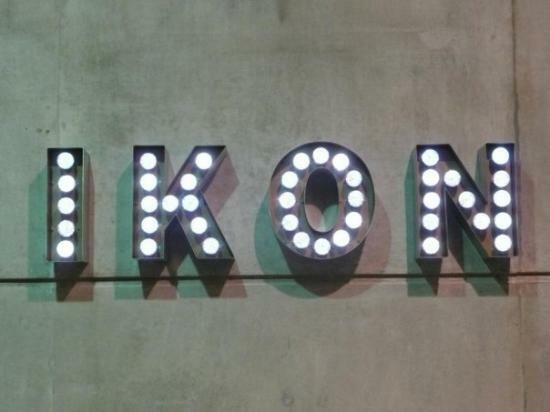 The concert took place in one of the Ikon’s galleries, and part of the concept was that the sound would be different in different parts of the hall, so that the audience was actively encouraged to walk around. There were not many chairs, and the audience quickly relaxed into whispering and strolling. The atmosphere was more that of an exhibition than that of a gig. Indeed the exact nature of the performance was not always clear. A round table with half-a-dozen silent people hunched over MacBooks and mixing desks looked like an important part of the installation and was presumably the source of the music. The quite clearly-identifiable pieces that started the evening were later succeeded by a more organic sound. The program notes were vital to interpret what was going on: it was a series of precomposed, prefabricated pieces followed by a live performance, in which the concert-goers’ murmurs and shuffles, picked up by microphones, were modified by the on-site laptop team to create the sound. More help would have been useful at times. The artists’ statements in the notes were useful to prevent getting lost, but in some cases one couldn’t help feeling the artist, or their academic colleagues, was perhaps the only one who really got what was going on. Likewise, the nature of the live performance was unclear: presumably those already clued in could appreciate what exactly “live coding” entails, and how their “structures in software” were “in keeping with post-free jazz developments in improvisation”. Those parts that were accessible were fun or interesting. Clearly every member of the team brought something personal to their piece. Many of the compositions were by postgraduates at the University, and it is clear why they pursue these avenues, these sounds: because they are really, really into it. At the very least, being a tourist in their soundscape was an interesting experience. For making the most of it, you may need to bring a tour guide. A new Brand of Revolutionary? It always says something about the stability of the ruling elite when the court jester starts calling for the king’s head. This happened last month when the normally stuffy and rarefied confines of BBC’s Newsnight were shaken up by Russell Brand using an interview with Jeremy Paxman to call for revolutionary change. In contrast to the usual parade of hapless career politicians and establishment ‘experts’, the boy from Essex attempted to speak for what he called ‘the disenfranchised, disillusioned, despondent underclass’. Or to put it in less wordy language, the working class, which he comes from and continues to identify with. At the time of writing over 10 million people have viewed the uncut version on Youtube, with activists seeing many ‘normal’ friends share it online, showing the anger and disgust felt towards the vague notion of the 1% and their pals in parliament. Brand wore the fact that he’s never voted as a badge of honour, winding up his interviewer by seemingly sticking two fingers up to ‘democracy’ as Paxman sees it. But a third of the registered voters didn’t bother last time out either. Add in ‘protest votes’ for small parties, and ‘none of the above’ becomes the UK’s largest political party. What this really shows that what ordinary people lack in this country is a party of their own. The politics graduate clique ruling New Labour seems embarrassed to have any links to working men and women through trade unions – also known as organised labour. Instead they try and target increasingly more bizarre sections of the population such as ‘Aldi Woman who lives in Loughborough with her left handed husband and 3.574 kids’, ‘fans of David Bowie, but only the pre-Berlin albums’ or ‘owners of a second hand silver Ford Focus’. Or in other words, anyone but the working class. While Ed Milliband thought that pledging to cap energy prices and create more private gas and electric companies to spend half your Sunday comparing was a bold move, 68% of Brits think that they should be fully renationalised. The same goes for the railways, which 70% of the population would like to see publicly owned, or Royal Mail, where the selling of shares could’ve been made unworkable by a pledge to renationalise it if Labour get elected. On these issues and many others statistical evidence and word of mouth show most people are well to the left of the current blue, red and yellow brands of pro-big business politics. This, along with the likes of Owen Jones, Mark Steel and now Russell Brand being raised on a pedestal by many young people looking for an alternative shows how a new party based in working class and poor communities putting forward demands in favour of the 99% could capture the imagination. Rather than existing to provide it’s leading lights with a cosy job and ego massage it could stand candidates who will only take the wage of an average worker and devote their energy to helping to build the campaigns on the streets and the estates that can change things. Can’t be done? The West Midland’s very own Dave Nellist spent two terms as an MP in Coventry during the eighties, supporting the miners’ strike and the anti poll tax campaign that brought Thatcher down. But more than just ‘fighting the good fight’, what’s really needed is mass action by the 99% to replace the current system of voting every four years whilst 147 mega-corporations will still control 40% of the world economy. In other words, a revolution. 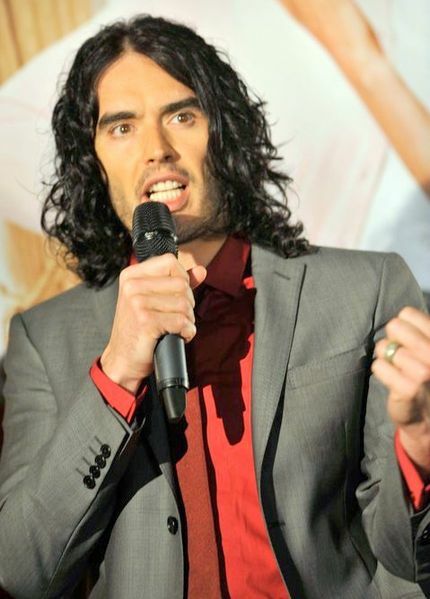 If by his own admission Russell Brand is unable to offer concrete examples of what this would mean, then as a start workers control of those 147 on a democratic basis could start planning of food production, energy, and the worlds resources to meet human need rather than shareholder profit. Wether we should turn Brand into a figurehead or leader for the kind of mass movement we need to make that happen is questionable, not least due to his patronising attitude towards women (plus alleged sexual harassment) and the fact that his fame and £10m fortune has perhaps given him less of a handle on the problems of everyday life these days. But that doesn’t change the fact that he was right that we need a revolution to stop the disgusting poverty and inequality that exists under capitalism. And if just a few young people watch the interview, google ‘socialist egalitarian system’ and decide to dedicate themselves to bringing that about, then he’ll have done a good job. Imagine, if you will, walking into the above scene. What thoughts would fill your mind? Would you be horrified by the carnage and destruction? Would you ponder the decades of Brum history that had once taken place in this now derelict and abandoned space? This was the vista that presented itself to me at the beginning of my journey to become a nightclub owner. Not a huge megabucks, all singing, all dancing glitzy behemoth that you might find up on your journeys along Fraud Street (that’s Broad Street for the uninitiated! )No, nothing like that at all. My vision was just a small, intimate, humble underground music venue. That dream is now a reality. 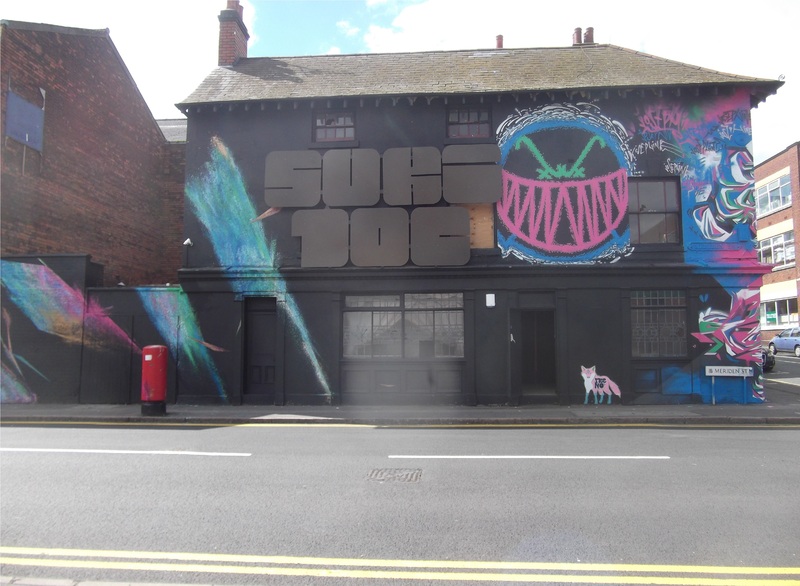 Suki10c is that venue, one that operates on a shoestring yet strives to be as creative, diverse and unique a space as any you might find in this supposed creative quarter of the City: the place we all know and love, called Digbeth. I had walked past this empty and run-down place many times. Mostly on nights that I was out distributing flyers at the old Medicine Bar in the Custard Factory, or up at The Rainbow, when The Rainbow was ‘just’ a pub. I’ve been organising events and handing out flyers for far too many years now, starting off way back in 1995. So, you see, I can honestly say that I had walked past this old space thousands of times. It had, once upon a time, operated as a back street pub called The Spotted Dog. But, after providing years and years of alcoholic escape to its dying and dwindling number of regulars, it finally succumbed to the financial black hole and closed its doors for one last time. It then stood, empty and rotting, abandoned for just short of 4 years. In that time, Ye Olde English Scrap Thieves had taken it upon themselves to rid the place of all its valuable copper, as they do. Not ones for taking much care of a place, these malefactors ripped the walls and floors apart to get their dirty digits on the desired metals. 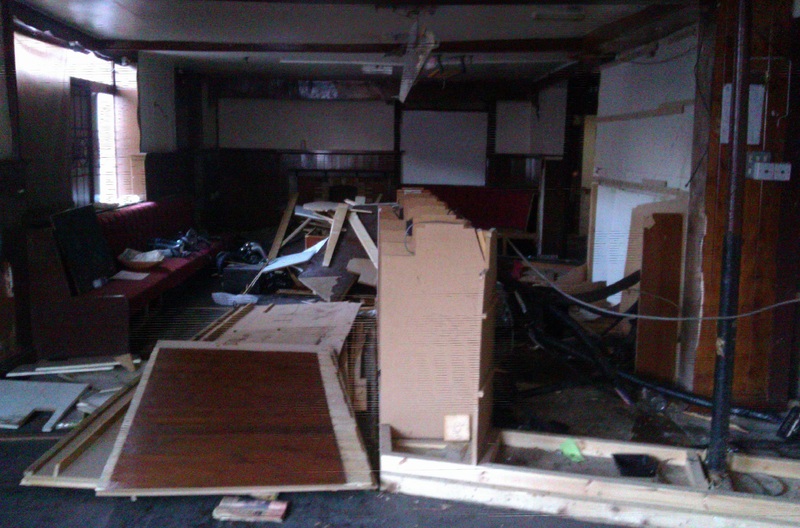 That is how a once lively and loved inn became a gaping, festering hole, rotting its way into oblivion. No more than an unsightly blot on the industrial landscape simply awaiting demolition. From the outside it appeared thus. Yet something about it called to me. It called to me again and again, with every footstep I placed past it. Time after time, I played with thoughts in my mind of what might be, how this place could actually look given a bit of tender loving care, a smidgen or two of effort and a lick of black paint. It’s all about the black paint as you’ll come to know in time. It became somewhat of a gnawing passion, obsessively nibbling away at my grey matter on a daily basis even when not passing by the building. Day after day, week after week, month after month. But procrastination is opportunity’s assassin, as Victor Kiam once said. Victor Kiam? His wife bought him a Remington shaver once and he became famous for saying “I liked the shaver so much, I bought the company”: a top bloke and a great entrepreneurial example. My own procrastination was destroying my opportunity to do something with this building. Then a personal tragedy shook my world apart. A very good friend, a lad who had been involved in many of my promotions, a chap who had worked so very hard with me on events such as the legendary Drop Beats Not Bombs (yep, that was my steed for ten years), a perfect gentleman by the name of Kreios Draeden was killed in a car crash the day after his birthday. He had been enjoying his birthday in London and decided that he would drive to Hastings for a day at the seaside. On the way, his car was involved in an accident and Kreios died at the scene. You’ll see a beautiful mural of Kreios painted on the back wall of the bar – keep a look out for it when you visit. This awful and tragic happening was the catalyst that forced my hand. I decided that there was no time to put things off. Everything can be gone in the blink of an eye so why bother waiting, hanging around for some good reason to do that which you have always wanted to do. I did what I needed to do, made the calls I needed to make, pulled the strings that needing pulling and strapped myself in for the rollercoaster ride that the last 16 months have been. Weeks and weeks of hard work, a team of people that pulled together when needed and almost pulled each other apart, lashings and lashings of black paint to create an individual, unique, iconic, energetic underground music venue. Thus, we have a creative space that welcomes musicians and allows artists of all sorts to adorn the walls, ceilings, woodwork, and literally anywhere with bits and pieces of artwork. Now that crumbling husk looks a bit like this. Since this picture was taken there have been more artwork additions and there will be more to come. That’s how we like it, constantly evolving and organically expanding art. The brutality of modernism? Birminghams Library. Birmingham central Library from Wiki. Some of the most abominable examples of modernist architecture cannot fail to evoke the question: for which possible world was this meant? Though seldom is the incommensurability of two periods so absolute as to render a once shining, futuristic construction both – paradoxically – totally alien and thoroughly antiquated to later generations. We can, for example, take Frank Lloyd Wright’s ‘Fallingwater’ and admire the harmonious composite of nature’s indomitable elements with human rigidity. Or there’s Lloyd Wright’s ‘Darwin D. Martin House’ which, with its open-plan gesturing to the outdoors, still looks stubbornly modern even over a hundred years after its construction. Elsewhere, Le Corbusier’s 1956 Assembly Hall at Chandigarh, India – a prototype of which Lloyd Wright described as a “massacre on the waterfront” – has an august horizontality to it which suits its severe, silent, timeless background: the Himalayas. 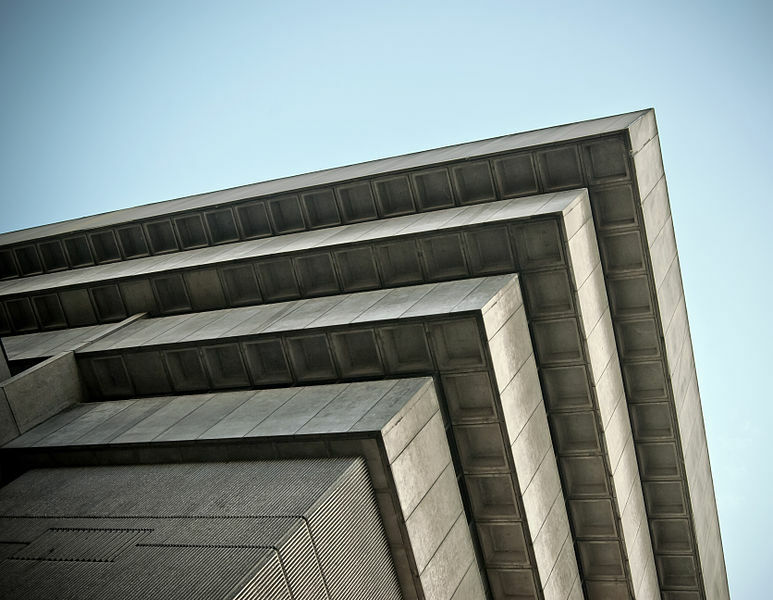 Why then, does there appear to be something unforgivable, something utterly divisive, about the old Birmingham Central Library with its 1970s Brutalist architecture? We are often – too often – quoted Prince Charles’s disparaging remark that Birmingham Central Library looks like “a place where books are incinerated, not kept” – a quip which singularly fails to elucidate anything. What must a library look like? And come to think of it, is that what an incinerator looks like? If one cannot see authority in tradition – and it would be self-defeating for Prince Charles not to – then there is no reason why form should be beholden to it. Why should a bank, for example, look like a recognizable copy of an antique Roman structure? For modernism in architecture this was precisely the point; theirs was a time for innovation, for the replacement of habitual techniques by experimentation with new identifying marks, pleasing shapes, and untried materials. To judge a building we must take it on its own terms lest we become embroiled in a partisan politics which the most public of all arts cannot fail to evoke. We might then say that the old Central Library suffered from two afflictions – one intrinsic, the other extrinsic; one the symptom of modernist architecture, the other the epitome of petty officialdom under late capitalism; one aesthetic, the other social (if this distinction is indeed possible). And one – admittedly – subjective, the other – fortunately – remediable. The first affliction. Perhaps the most significant, most meaningful, element of any building is its readability – how, and by whom, is a building to be read? For example, when architects are employed to design a venue – a bar or a coffee shop – they may be briefed so as to make it more ‘readable’ to a desired clientele – say, the wealthy – whilst making it harder to read for ‘undesirables’. 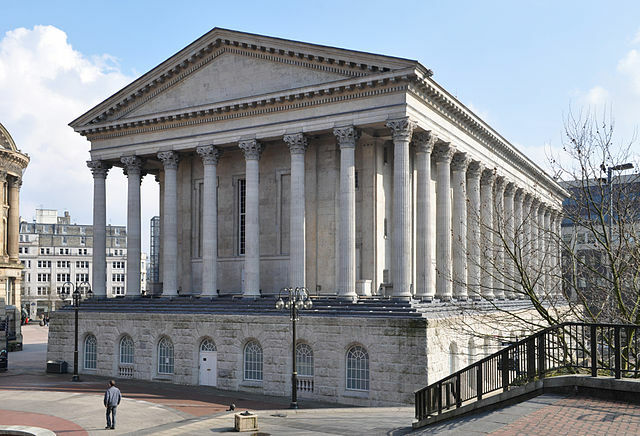 How, as a civic building, is the Birmingham Central Library to be read? To stretch an analogy: it’s illegible. And no doubt this is due much to the fact that it seems to disregard, in form, the elements – the ‘instinctive’ purpose – we expect of a building: security and stability. These elements, prior to materials, are what make a building beautiful. Arthur Schopenhauer understood this well when he wrote that “the sole and constant theme [of architecture] is support and load.” That is, that “no load may be without sufficient support, and no support without a suitable load.” With the Birmingham Central library we find the contradiction of this principle; load is seemingly disproportionate to support, and the relation between rigidity and gravity is obscured, all of which induces an uneasiness in the observer. One may even go as far as to call the obfuscation of these elements ‘disturbing’ when one recalls how, in 1999, part of the library’s concrete cladding fell off, narrowly missing a member of the public below. No doubt this in part also explains the elegant beauty of Town Hall, for it is column and entablature which exemplifies the relation between ‘support and load’ in its purest, most apparent form. Indeed, the simple, rigid economy of Town Hall makes the ornateness of Council House seem somewhat gaudy – though at the least even the latter building, contrary to the Central Library, didn’t use the means of art to entirely efface its purpose. Perhaps I am too hasty in dismissing the old Central Library as using the means of art without due consideration for its ends (that aforementioned ‘instinctive’ purpose), for it has indeed been designed with consideration for its function. The building was open to a good amount of natural light so as to be conducive to study, but the design was also one of the first to recognise and counter the effects of ‘solar gain’ and the damage that this can cause to books. The large windows of the reference library face inwards so as to reduce traffic noise, and book stacks were kept short so that the library wouldn’t overwhelm surrounding buildings. We should, however, distinguish between ‘purpose’ as intrinsic and inherent to a building, and purpose as extrinsic – i.e. function. And it is with this that we can see the library’s second affliction. The Central Library was meant to be the crowning jewel of a large civic-centre redevelopment scheme consisting of a number of amenities (such as an athletic centre and a drama school), all connected by high-level walk-ways. The scheme was never completed, but one can see how the library embodied that civic-mindedness; the atrium, for example, was originally meant to open on all four sides, providing a well-lit, accessible space for public exhibitions. However, this civic-mindedness has been lost. The original vision of the library has been distorted by the inevitability of human spontaneity (as most modernist projects are) and a now-predominant instrumentality in thought (as much art is). The Central Library, and the public space it embodied, was bastardised at the very moment we asked ‘what else is to be done with it?’ The addition of fast-food chains and retail outlets overlooks the very essence of a public space. The library no longer stands as it was meant, its use is now incongruent with its design, and it has lost a certain something – a certain something which makes it ‘ours’. We can take by way of comparison the Boston City Hall which the old Central Library could well have been – and probably was – based on. The Boston City Hall has continued to be used for that which it was designed to be (though with some equivocation about its future). There have been no additions, not distortions, no attachments. And whilst it’s not exactly sublime, then because of this autonomy – this sovereignty – neither is it ugly. The Boston City hall belongs Bostonians – therein lies its beauty. And so if as a city we are ambivalent towards our library, then perhaps this because we ourselves demeaned it. 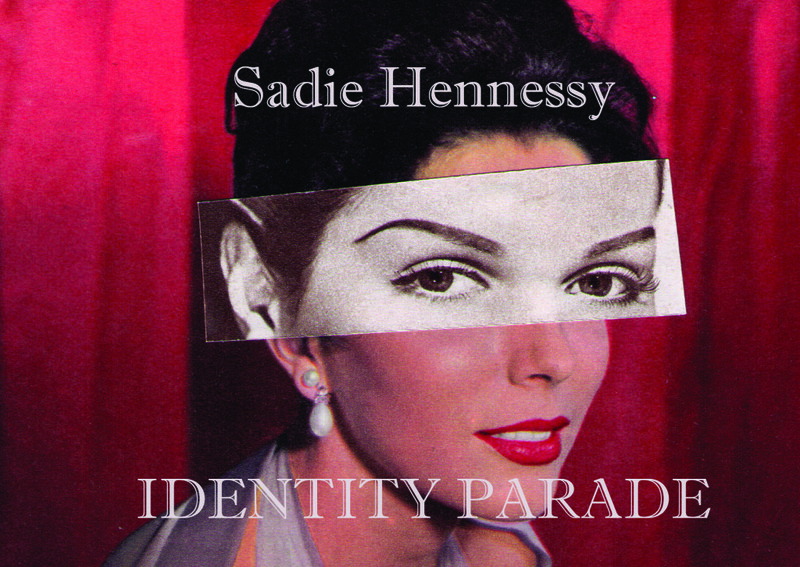 IDENTITY PARADE is the smart, current exhibition in Ort Gallery’s compelling series of invited installations. Kent-based artist Sadie Hennessy presents a large body of work deconstructing faces to give viewers an unsettled pleasure. Hennessy displays clear confidence in her work, which fits solidly into contemporary British art. Her creative approach is intuitive and demands an intuitive reaction—tempered by awareness of current artistic scenes. Her solo exhibition here makes it clear that she is as keen to talk to fellow artists, amateurs included, as to engage the spectators. The benefit is that the gallery is livened up by a well-chosen collection of quietly humorous pieces which would fit well at most contemporary art shows. Her personal humour and charm was a good fit at the opening night of the exhibition at Ort, which was lively and accessible, supported by a free reception and friendly crowd. Hennessy worked hard to show that the face as we know it from prints and publicity is not so well-defined or cohesive as we might like, and contains seeds of many stranger things. The starting point was in old films: flat saturated photos of half-familiar faces from old Hollywood. She employed simple collage techniques throughout to turn the half-full-familiar into the half-empty-familiar, or distort it into an uncanny valley. (The artist also offered a collage workshop on 9th Nov, contributing to Ort’s packed schedule of skill-sharing.) In particular, splicings of headshots of actresses from the fiftiesmostly showed me a reminiscence of the Queen, while _Porn Star Eyes (i through viii)_,by its straightforward pasting of eyes from (only presumably sexual) photos over eyes in the (only presumably dignified or sweet) originals, forces a consideration of where exactly the startingly noticable difference lies. The historical and celebrity context played no role: the headlining piece uses Sophia Loren without regard for her fame, for the chance to paste and splice the personality in the photo. The viewer’s reaction seemed to depend largely on what they brought with them. Hennessy’s Parade here functions as a kind of uncalculated mirror, a sometimes-naïve presentation that does not offer too much structure, but that provides the viewer with a good opportunity to think about their own reactions. A short visit will certainly be rewarding—there’s a good chance to catch a strange reflection of your own face somewhere in the strangers’ faces. The opening at Ort came just before the two-year anniversary of the gallery and cafe (also marked by a successful party, friendly crowd in attendance). The space has had a remarkably consistent series of exhibitions in this time: the cafe features smaller, more frequently changing collections by predominantly local artists, and the main gallery upstairs attracts a fresh and varied set of artists for larger, longer exhibitions, with careful and well-connected curation.